…and as of October 4th, four days in, it’s a challenge for real. What’s the challenge you ask? It’s 30 days of exercise, at least 30 minutes every-single-day. Seems easy right? Yep, until all the excuses and reasons you had before seem to still be there. I have not been to the gym the past few days. I just haven’t. But, I have been adjusting my habits. Sunday instead of driving the mile to the hospital to visit my mom I walked. It’s not that far and was a way to get in exercise. I also did some yoga poses for stretching. Monday I did not set aside the 30 minutes but I did something else. I took the stairs. I park on the 5th floor of the garage and I forced myself to walk. I was out of breath and ready to break the glass on the fire extinguisher just because it said “in an emergency.” I also made the decision to watch what I eat. I didn’t stuff myself with candy, snacks, cookies and cakes like I may do on any given day – most days to be honest. For dinner I had a kale chopped salad and okra. No meat!! Didn’t want it and released the feeling that I needed it to make my meal complete. Let me backtrack. The okra was fried okra but it was fresh, crisp and homemade (at the restaurant) and was sooo good. I guess that was my meat substitution. And only one glass of wine. Tuesday I took the stairs again (pats self on the back, looks for oxygen mask) and instead of getting in my car and driving the 1/2 mile to grab lunch, I walked. It felt really good. Last night while doing laundry I decided I needed to get 30 min of movement so I walked, yet again. During each cycle I went outside and walked briskly. I could not let myself stay stagnant. Check out what Pacer said I did on my phone (see pic). Today, Wednesday, as I sit and gaze at this beautiful day from the 21st floor of my office, I’m also psyching myself up to take the stairs down 21 flights when I leave for the day. Don’t laugh, it’s harder than you think. I was forced to for a fire drill and baby when I tell you my legs felt like melted jello…ooohweee. That’s what I’m going to do. No, I can’t take them up because of security measures I won’t be able to get on to my floor and I don’t want to be left for dead when around flight 6 I pass out; BUT, when I go to the gym tonight, I will hit 21 flights on the stair master and try, really hard, not to fall over that rail. Note to Planet Fitness: please have paramedics on standby…please. P.S. It’s October and you know what that means…Pink Out. It’s Breast Cancer Awareness Month. I am a survivor and this is my continuous survival journey. …yes I AM! Six years ago, in December 2010, I laid on a table in a lab getting an ultrasound that would change my life forever. Breast Cancer. Though not confirmed it was evident. Fast forward to six years later, December 2016, I laid on an MRI table, in that same lab, wondering if my cancer had recurred. It was an ire feeling walking in there, sitting, waiting, reading vibes, etc. Yes, for the past six weeks I’ve been living with a secret, shared with only God and two people on this earth, that I may have to go through this all over again. Had my cancer returned? Yes, I am more than a conqueror! Well, I am thanking and praising God on this day that my results came back negative!!!! Hallelujah!!!! Although I certainly did not want to travel that road again, I had began preparing myself for what was to come. This is a wake up call. I realize I need to focus strengthening myself mentally, physically and emotionally. More so than before. I talk a good game in my mind but that doesn’t always translate into action. Starting now, and not the coming year, I am taking better care of myself. I would like to thank the two individuals who held on to my secret, praying with and for me, holding my hand until we witnessed the good news of God’s grace. I love you all and am eternally grateful. It means more than you could ever know or I could ever express. As I continue my journey of survival, I know I’ll fight for the rest of my life. And that’s okay because as long as I’m fighting, I’m here, surviving. I love my life. I love God. I love all that have been, continue to be and are to become a part of this walk with me. To all my fellow survivors, keep fighting. We are more than conquerors! …I went! Yeah I know that doesn’t rhyme but who cares, I FINALLY got back in the gym. It’s been a while, a long while, over a year since I graced the floors of a gym. It’s not that I didn’t want to go, I had other financial priorities and a gym membership wasn’t one of them. Yes, I know that’s no excuse. I could work out at home, outdoors (not in the summer in Arizona), etc. etc. etc. I didn’t. Should I have been, yep. Was the intention there, yep. Did I, nope. Now that I got that out, here’s how it went. First, let me admit that I signed up for another gym membership over a month ago with the idea that I was going to work out nearly every day during my free month, after all, I have a 30 year class reunion coming up, Go Pirates. That’s what my mouth said. Didn’t happen. 😕Last night, after having worked, Bible study, and outreach I wanted to go sit and have some wings and drink. Mind you, my plan that morning was to do all I mentioned except the food/drink, I planned to for the gym to be my final stop. My bag was in the car and I was headed to go eat, drink and be merry. I am thankful I got a PUSH I needed. An encouragement to just go. Don’t divert, “go workout.” After stopping at three different stores I reluctantly went. I’m back! Baby Workout. Photo snapped at Plant Fitness. It was a long walk from the parking lot to the inside of the door. I sat and pushed myself to go. The parking lot was full and I thought, “ugh, too many people, I don’t feel like this.” I kept pushing. I sat in the car perusing through social media, mentally I kept pushing. I walked really slow going in, I kept pushing. I fumbled through my purse to find my member card, I kept pushing. I momentarily stared at the bucket of Tootsie Rolls on the desk, sheesh – the struggle. I resisted and kept pushing. I made it to the locker room, changed and hit the treadmill. I PUSHED MYSELF! I did a solid 45 minutes of cardio (not incl cool downs). I didn’t push too hard on the workout wanting to ease by body through the shock of it all. I was panting on a 2.0 speed on the treadmill. LOL! When I paused at 5 min to stretch…ohhhh…my ligaments were so tight, felt like pulling steel. I gradually increased the speed and incline. 35 min done. On to the elliptical. Sweating. Heart rate up and now I have my mojo back. 18 min done. I was ready to keep gong but stopped. I know my body. …wait. Am I sure I am ready to go? For my year-end post, as many do, I’d like to reflect a moment. I’m still here and I thank God as there is a reason for it. I’m not as healthy as I’d like to be but it’s not as bad as it could be as I have all my faculties. I didn’t work out like I should have but I can still walk and run, bend and straighten. I gained a few lbs back, 10 to be exact but remained under a weight I said I’d never hit again. I shed some tears yet cleansed my soul. I left a job and gained another. I lost friends but are they really friends if you lose them? Maybe I should say I lost acquaintances because my tried and true friends are ride or dies…with each other until the end. I learned and acknowledge some hard, ugly truths about myself and commit to change. I’ve been up more days than I have been down. I have bad days, many of them, and I have double the amount of fabulous ones. I’ve had bad attitudes and extended a helping hand. I’ve hated and I’ve loved. I’ve envied and I’ve congratulated. I’ve rolled my eyes and I’ve smiled. I’ve thought and I’ve acted. I gave up and I’ve started fresh. I’ve let go and let God. I’ve feared and have immersed myself in faith. With that…I’m ready…let’s GO! Next year I will share my intentions for the new year. For now, I want to leave you with a song. I was watching a performance of this song with someone last week and I mentioned how I loved the song. He asked if I knew who wrote/performed the original. I couldn’t remember. He said Nina Simone. “That’s right!” I said. Which gets me to thinking, we often forget how we start, we forget the fire we had in the beginning, we forget the reasons why…but let’s always remember, with any and everything, tomorrow, God willing, is a new day…A New Dawn. Happy New Year! I’ve been quiet to say the least. 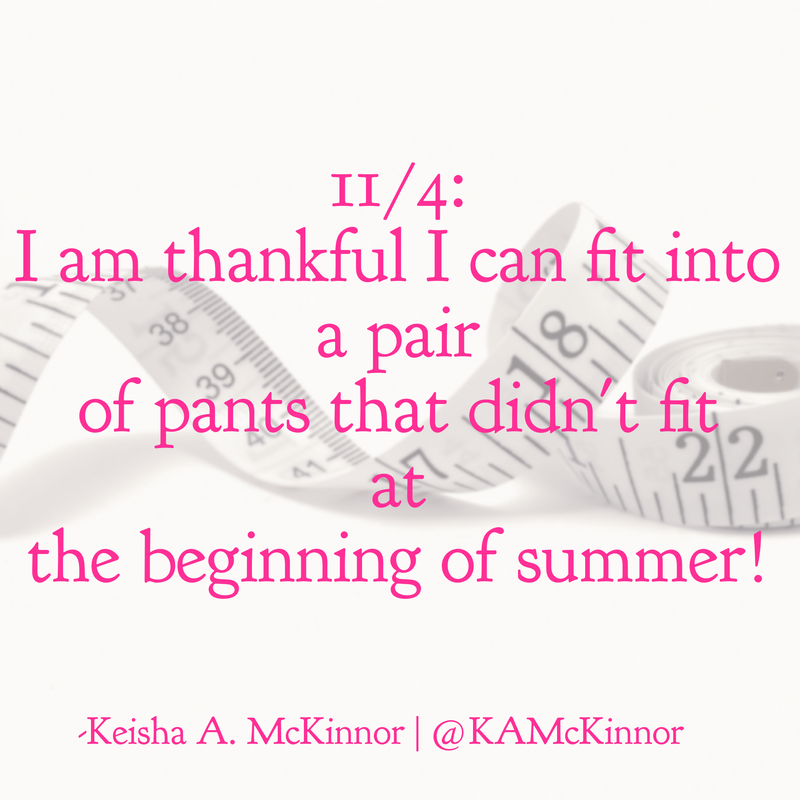 My last blog was on 12/31/14 where one of my resolutions was to blog once every two weeks. Well…that didn’t happen…yet. I can, and will, do it for the last half of this year. Let me correct myself. I can do it for the first half of the new transformation in my life part of the year (if that makes sense, LOL, it does to me). Where do I begin. I started the year off in good physical shape. But not so much in other areas of my life. I was working a job I despised and my kid was testing me beyond the limits. In the past six months I’ve laughed, cried, celebrated, worried, panicked, lost my job, loved and UGH…gained weight back…ARGH! But not all of it. 😉 With all of this, I have learned that your emotional and spiritual shape is just as important as the physical. They all feed off one another. So, I was left my job back in March. I was down right miserable. Why was I miserable? Well, I was waiting on God to provide that answer. And yesterday, I finally got it. I needed to rest! I needed to emotionally rest. Ever since my battle with cancer in 2011 I have not emotionally rested. I worked while going through chemo treatments, worked while receiving radiation, worked through my surgeries. I came down with pneumonia and had to return to work before I was totally healed. Returned to work well before I should have after my hysterectomy last year. Work…work…work… I worked two jobs for the first 10 years of my son’s life (three at one point). I don’t stop. It was time for me to STOP! Why, because I need to be prepared for this next journey. And it all comes together. My spiritual well-being dictates my emotional well-being which dictates my physical well-being. This may not be news to most, but for me, I finally get it. Now that I’m rested, today, God began to reveal it to me. Thank you Lord!